Today I was at Pier Aquat­ics (Wigan, UK) and unusu­ally they had a tank of Paros. 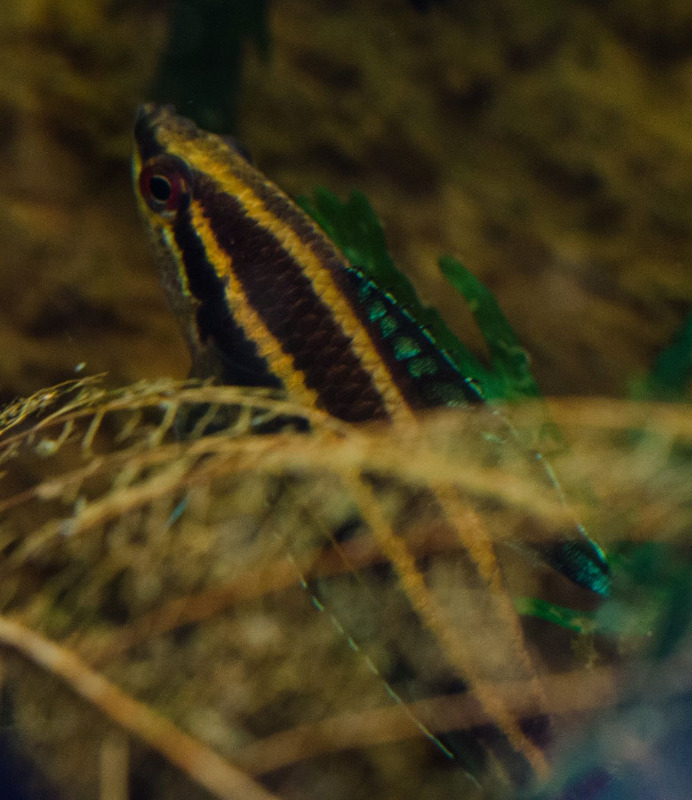 On the tank they were just labelled Liquorice Gourami, but I asked Rachel to check what species they were. Appar­ently they came in on a direct import from Thai­land about 6 weeks ago, and were listed by the sup­plier as P.paludicola. 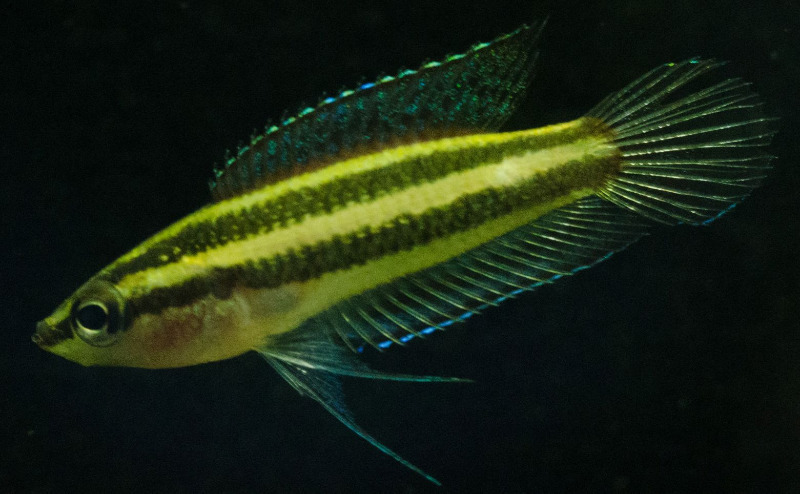 There were about 40 fish in the tank, but many were in poor con­di­tion. I bought six, try­ing to avoid the skin­ni­est ones. They are now set­tling into one of my acidic tanks with a buf­fet of live foods on offer and I have seen sev­eral of them out hunt­ing morsels. 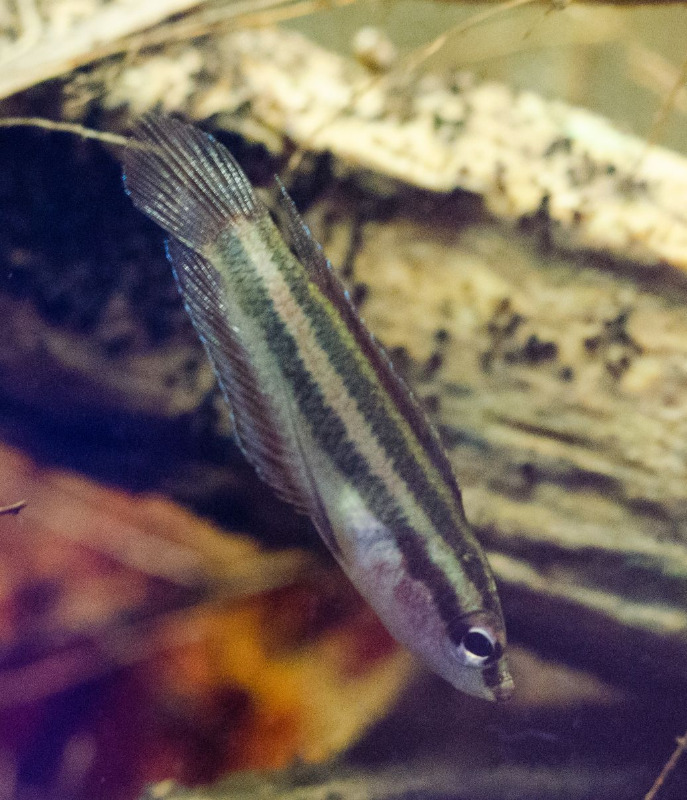 They were an unplanned pur­chase so they’re cur­rently shar­ing a tank with half a dozen Poe­cilocharax weitz­mani of sim­i­lar size and require­ments. I have attached the three rea­son­able pho­tos that I have man­aged since bring­ing them home a few hours ago (show­ing two dif­fer­ent fish). I’m not an expert on these, though I have kept one pair of Paros before. Per­haps I will need to feed them up and let them set­tle in a bit more before we can be sure of the iden­tity? Please Log in or Cre­ate an account to join the conversation. The mid­dle photo to me looks like palu­di­cola all right. The other two pho­tos are not pos­si­ble to id. Palu­di­cola also is a species where it makes sense with the import from Thai­land as their nat­ural habi­tat is in the very north of Malaysia bor­der­ing to the South of Thai­land. They do look thin and not too good. Please be care­ful pro­vid­ing good water qual­ity ? and good food. Sounds like you are doing that. Palu­di­cola is very very rarely in Trade. Many thanks for the quick response. I’ll take the best care of them I can — although I could see that they were thin I thought it was bet­ter to try and save them than to leave them to starve in the shop (where they were being ‘fed’ with pel­let food). The tank they are in has a con­duc­tiv­ity of 10us/​cm and a pH about 5.0, it’s been run­ning very sta­ble as an acidic tank for sev­eral years. Foods offered so far include grindal­worms, moina, daph­nia and some other small crit­ters from a tub in the gar­den. That Sounds really good, yes, would have been quite an ordeal for Them so long time with no proper food. Thanks Helene. I’m not on Face­book at all, but feel free to re-​post the info there. Here are a few more pho­tos of the new acqui­si­tions, taken yes­ter­day and this morn­ing. 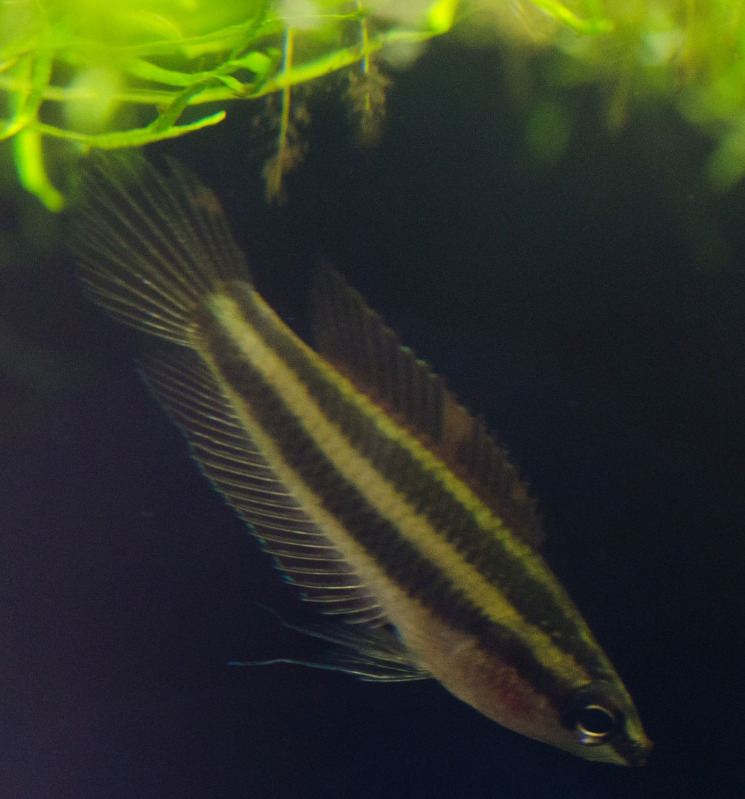 Sorry for the qual­ity but as you know they are shy fish. One of the better-​looking ones (still rather skinny and less than 20mmTL) often seems to patrol around under the float­ing plants near the sur­face. The oth­ers usu­ally pre­fer the lower lev­els of the tank among the leaves and seed-​cases there. 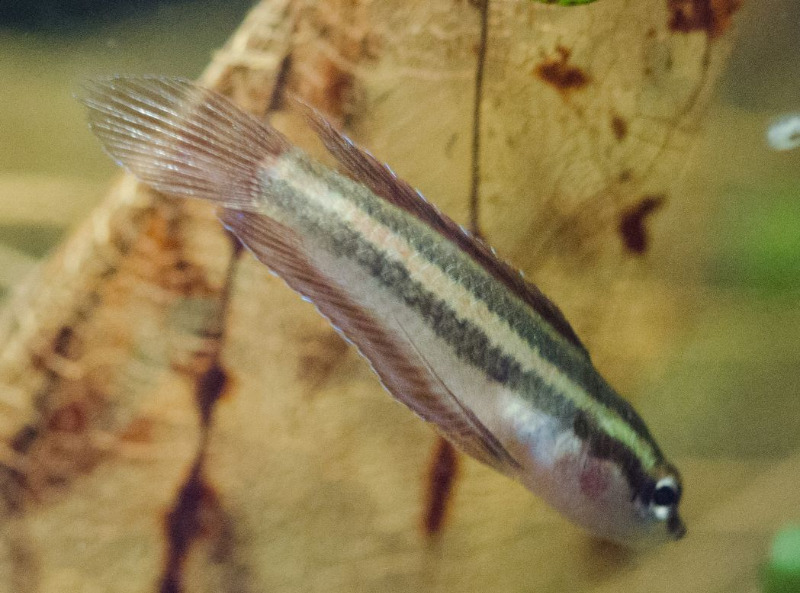 I haven’t seen any inter­ac­tions between them and the equally shy and sen­si­tive weitz­mani tetras in the same tank; hope­fully there are enough hid­ing places for every­one. Hope­fully the paros will eat and get stronger. He is a dif­fer­ent species, of course, so I’m keep­ing them sep­a­rate. 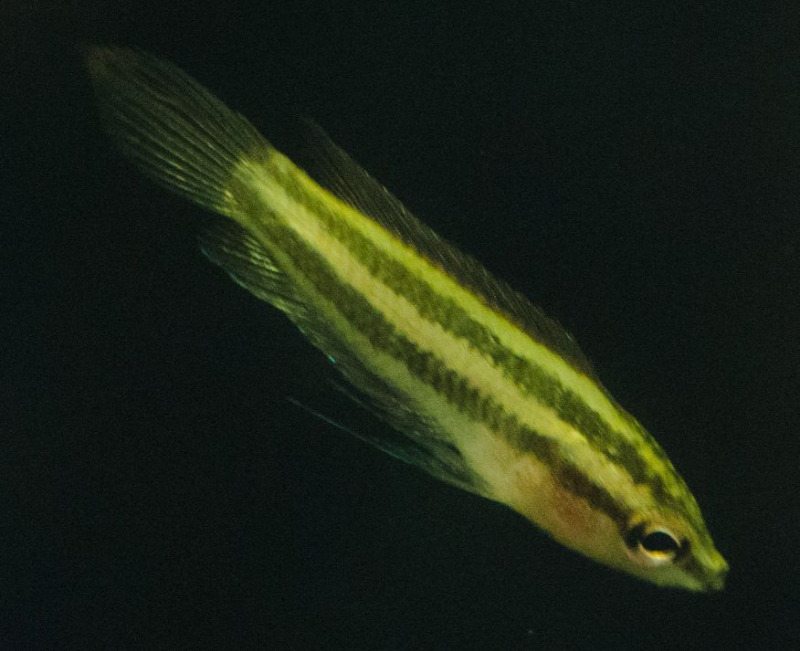 See­ing him has made me realise quite how small and skinny the new P.paludicola are. Some of the live foods I have offered (e.g. daph­nia) are too big for them, but hope­fully the grindal­worms and moina will be palat­able. 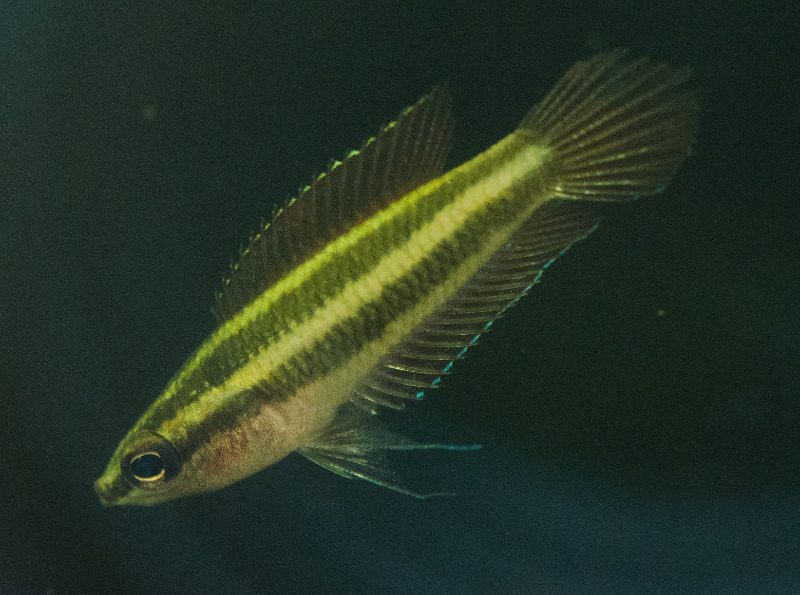 Hope­fully I can nurse the new P.paludicola back to health. Once they’re healthy then I would con­sider pass­ing them over to a more expe­ri­enced Parosphre­menus breeder, given their rar­ity. I also hope that some­one else in the project will be able to acquire and save some more of this import.